If you go for the first option you can learn from the users that already created something you like. That way you learn the basic ingredients for certain types of ambiances and can adjust them to your own ideas. This is a valuable learning shortcut where you gather experience with sounds and mixing options. Let’s take this example of a restaurant audio background. It is a nice audio background track that recreates a busy restaurant. Imaging clients coming and going, plates being brought by the waiters and put on the tables, the busy kitchen in the background, people talking and some basic restaurant music in the background. It’s very easy to recreate such an atmosphere or make it your own with some small changes. You can start by deconstructing the track with a click on the “mute” check box in all channels. Now start unchecking them one by one. You will hear the single sounds that conform the mix and notice how they sound individually. This way you can decide if you prefer to have less or more, lower or higher volumes of any sound. You can also change the sound of a channel. To access the sound of any channel you can just click on the “Load…” button of that channel and search for the sound it contains. You see the name of the sound above the button in a tiny text ticker. Now start browsing the sound database to find any alternatives that you like. If you let the whole mix playing while you look for a specific sound, you can test the outcome in real time. Once you found your alternate sound, just experiment with the volume adjustment, make it sound from right to left or viceversa, try the crossfade button or the randomizer. Once it sounds nice to you, get to the next channel. Keep in mind that the database also involve some complex sound groups. 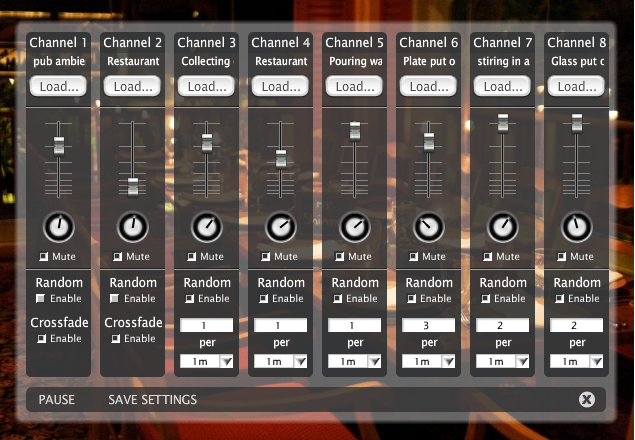 You can instantly upload a given ambiance into a single channel and thus convert it to a “single sound” for a channel. You will find many complex sounds like “restaurant music”, “traffic jam” or alike in the sound database. 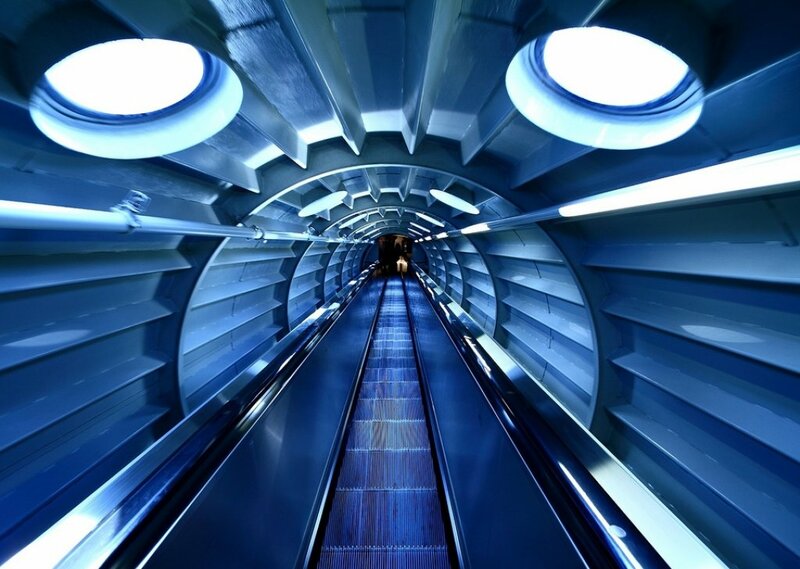 These gives you plenty of options to create really sophisticated atmospheres. Just listen to a moderately complex stuff packed into eight tracks to create the acoustic simulation of a pleasant restaurant. We have analyzed the restaurant ambiance for you in this little video, where you see how it is built. We can analyze the sounds of this background audio mix by decomposing the track. First we mute all channels. Then we listen to them separately. We will see that Channel 1 packs a complex pub ambiance background sound with several people chatting around. You will notice that there are people talking from the left speaker and some other voices on the right speaker. This makes for a spatial effect, you seem to hear people in a larger room, sitting at various tables in variable distance to you. Channel 2 hosts another complex restaurant music track. The music is a simple electric piano background as you would find in many restaurants. It is very repetitive and a bit monotonous. The crossfade effect serves smooth repetitions. This track alone is dull and boring, but such is the usual restaurant or elevator music. Now you can decide to leave it as is with a low volume that just fills the empty acoustical spaces between the other sounds. Or to change it for another kind of musical background. In Channel 3 you hear the sound of someone collecting glasses. The single play of this sound contains several glass collecting moments. Now think that in a restaurant the waiters collect glasses only now and then, once the customers order a new drink for example. So this is a typical background noise you wouldn’t want to repeate over and over but only sometimes. That’s why the randomizer has been used. You can decide how often your imaginary waiters will collect some clients drinks and choose a number of random repetitions in a time frame of one minutes, 10 minutes or an hours. This will be an indicator for the “busyness” of your imaginary restaurant. The same applies to Channel 4, where you hear the restaurant’s door closing and a little bell ringing each time a “client” comes in. During the time gap the door is open you can hear the street traffic outside. Same as in Channel 3, in Channel 4 you use the randomizer to distribute your virtual clients entrances. And this way you continue with the rest of the channels that also contain single sounds of typical restaurant events like the pouring of water into a glass from Channel 5, the sound of a plate put on the table in Channel 6, the stirring of a cup in Channel 7 and the sound of a glass put on the table in Channel 8. If you imagine a realistic acoustic background, you realize how often each sound should be played to emulate reality. The great feature of the randomizer is that you avoid boring pattern repetitions and make the scene lively. So, listen and enjoy your own atmospheres!